This is Croatia’s Dalmatian Coast—a place where natural beauty, dark and ancient history and now a booming tourist trade collide. In the past few years, what was once a sleepy off-the-beaten-track destination has become a beloved favourite for travellers from around the world. Cruise ships pull into the harbours nearly year-round. Tour groups stop to walk the ancient city walls. And more and more people add the coast to their bucket lists each year. If you’re one of those people, here’s what I suggest you do, see, eat and seek out along the coastline. If you’re planning to rent a car, Split makes a great base for seeing the whole coastline and region. If you’ll be taking buses, consider dividing your time between Split, where you can easily explore the northern coast and islands and Dubrovnik or Cavtat—where you can check out the south and take day trips into Bosnia and Herzegovina or Montenegro. In Split, head up the hill just north of town (Marjan Hill) and stop at the coffee shop halfway up for a drink on a spacious patio with views down the hill to the city, port and sea. The coffee’s nothing special, but the views make it worth a pit-stop. Locals recommend trying the Pašticada (a local stewed beef dish) and the fresh catch of the day in restaurants like Fife and grabbing ice cream or a cake from Kuća Sladoleda. For fresh cooking ingredients (if you’re renting an apartment), the enormous market just south of the old city is bursting with fruits and vegies and butcher shops and grocery stores line the town square. In Dubrovnik, Dubrovnik Food Tours are an excellent way to get a sense of the local foodie scene and Wine Bar Razonoda offers up tasty charcuterie and cheese boards for two. Movies here are shown in English (with Croatian subtitles) and cost about $5 per person, so if you catch a rainy day, take the bus (or car) out to the cinema to catch the latest release. In Dubrovnik, the old city walls are worth walking, but try to pick a less-crowded day or time of year for an optimal experience. When you come down from the walls, don’t miss Dubrovnik Food Tours or the ferry to pretty Cavtat. If you visit in summer, expect high temperatures and big crowds. In winter, cool temps and good prices prevail, but many restaurants, tours and even ferry services close or cut their hours. Most flights from Australia will take you through Zagreb (Croatia’s capital) or another major European city with direct flights to Split or Dubrovnik. From Zagreb, you can either fly direct to either city (less than an hour to either) or rent a car and spend a day or two seeing the Croatian countryside on your way to the coast. When it comes to European destinations, Croatia tends to be a bargain—as long as you don’t base yourself in Dubrovnik in the heart of summer season. Expect western prices in the popular, tourist-loved centre of Dubrovnik and some of the resort areas along the coast…and big bargains outside the tourist centers. A month in Split, Croatia, including groceries, meals out, local transportation, gifts, and accommodations in November, cost me less than $1,700. 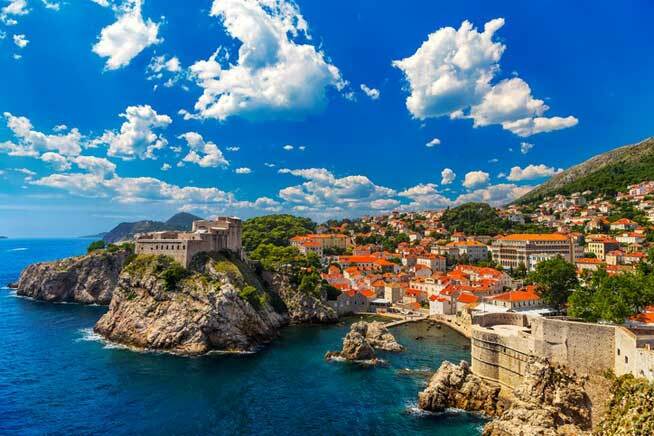 A similar month in an apartment just outside Dubrovnik for the month of March—again including everything from local transport to meals to accommodations and attractions—cost just under $2,000. Round-trip flights from Sydney or Perth to Split in October currently list at about $1,500. Sign up here for IL Australia’s e-letter and we’ll send you five free postcard e-letters weekly. We’ll also send you a FREE research report on the most desirable—and cheapest—retirement havens available to you today.